I just finished An Odd Quartet and thought it quite interesting, especially the fourth one. Glorious sunshine and a lazy Bank Holiday welcomes me to the week. A day of relaxation and writing, it doesn’t get any better. And to start the week let’s welcome J S Riddle to the guest author interview. I will introduce myself simply as J.S. Riddle. I may live in the southeastern United States but I was born in Oxford, UK and lived there close to my entrance into primary school. I am lucky (or cursed) to be able to have my time devoted to family and my writing. Okay, I fudge. I love my movies, music, and video games. I should add that too. Reading. So cliche right? But it did. It opened up a whole world that I didn’t realize existed. Then came the dreams, so vivid as if I were standing in the middle of them. Soon enough I found it was easy to turn those dreams, those ideas, into something on paper form no matter how raw. Things progressed from there. I suppose I was just starting to be a teenager at that time. If you could work with any author, who would it be and why? Being the genre that I tend to write, I would love to say Anne Rice, although she is a whole other league than I am. She is definitely a calibre above me, and that is being conservative. Stephen King was my first love, though. To crawl inside his brain and throw ideas back and forth? it would be amazing. How do you get in the mood for writing? Silence and darkness sometimes. Everyone has to disappear. No family, no tech, completely alone. It is the easiest for concentrated flow. Certain music helps if I know what I want to write and need a little “background music”. Being able to control the characters on the page and bend them to my will. Deciding who lives and dies. No, that sounds slightly devious. Actually what I enjoy most is to be able to take something that floats around in my noggin and turn it into a living, breathing, piece of work. When that happens I truly enjoy writing because I am in my own book, experiencing everything my characters are experiencing. I become my work. Editing, editing, and oh yeah did I say editing? I despise is. It is a part of the process though. Having to take my chicken scratch from paper and typing it on the computer, too. Have you ever attempted to decipher a doctor’s handwriting? Try having to do that, with your own words. There really should be a magical button to take your words, put them perfectly formatted in final form on the computer. There aren’t any lyrics to the theme for Game of Thrones are there? If that were the case it would most definitely be that. Music speaks a thousand words. What advice would you give new and aspiring authors? Research and listen to your peers. There are some out there that may not feel all too well you have added to their can of sardines, but there are some willing to take their time to really help you maneuver around. Learn about marketing. Even if you go traditional publishing you will still need to learn the in’s and out’s of marketing and technology. Don’t find yourself under the same rock I have found myself under. I am still trying to figure things out. 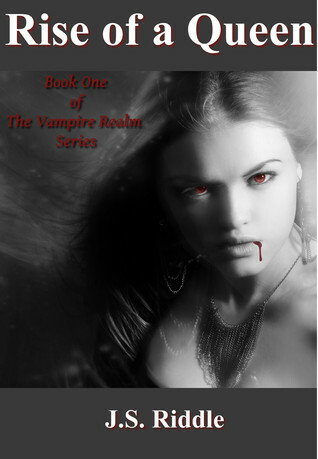 The second book in The Vampire Realm series, unnamed as of yet because I cannot find a suitable title that won’t give away important information from Rise of a Queen. It wasn’t even supposed to be a series actually, but I realized the word count was getting bigger and I found an excellent stopping point to leave people satisfied with the ending. Needless to say I already had half of this book written before I even made it the second book of a trilogy. Tell us about your latest work and how we can find out more. Rise of a Queen (The Vampire Realm)is what I currently have out. The best place to look is http://www.jsriddle.com since it has the most up-to-date information. It is in e-book form at Amazon, Nook store, Diesel, Kobo and by the time this is printed it should be in the iStore and Sony. The paperback can be found on Amazon at this moment, I am slowly working on other means of distribution. Thanks to J S for sharing her thoughts with us, on Wednesday Ernie Rosenburg takes his turn in the hot seat. Great interview. Any tips on how to make the family disappear for writing privacy? Ah, to be young and able to stay up until the AM hours. 😉 I yell, but I work out of the dining room (no office), so I’m ignored half the time. It’s funny, but the three-year-old is the least distracting. If he sees me working hard, he takes his Spongebob keyboard and sets up shop in the chair next to me to ‘work’. It’s adorable. Yeah my swords and knives are in boxes at the moment since we are hoping to move soon anyway. lol. Thats adorable bout the little one. You have a Bat’leth?